A buddy wanted to get some training time in on the legs and I'm always game for that. Gives both of us a chance to test out snow travel gear. 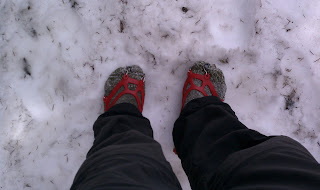 I fitted my VFF's with Micro-Spikes and a long sock to act as protection for the ankles when Post Holing. We started around 1,900' and our destination was at 5,800'. So that is a nice climb to do on a Sunday afternoon. Snow travel is like an Ab Workout that keeps on going for hours. I'm sure my stability muscles will be sore, they always are. Micro-Spikes worked like a dream for side hill,down hill and even up hill. I do need to invest in a Ice Ax tho. I traveled across a few dicey sections where I wouldnt want to make a mistake. Overall it was a very good day. Stayed injury free and got some priceless views. 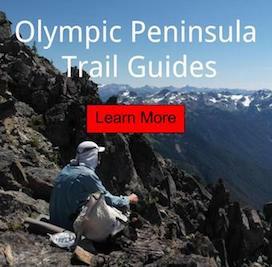 This is one of my favorite spots to go to because you have views of Port Angeles, Sequim, Strait of Juan de Fuca, San Juan Islands, Victoria, Mt Angeles and Mt Olympus to name a few.